I think Bert's review @SonicImmersion summed it up quite adequately. As did one of the comments under the Youtube clip of one of the tracks of this album: it comes close to muzak. It might as well have been the new album by Richard Clayderman. I'll pass. Never saw any 'notice' of this but Amore is out on LP legally. 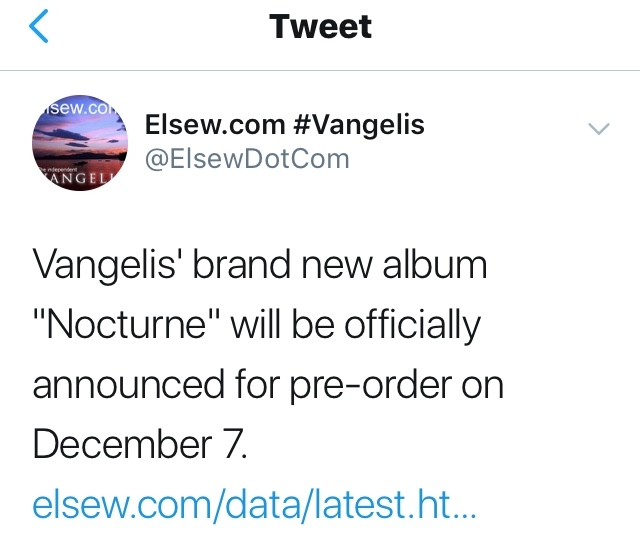 https://www.discogs.com/Vangelis-Papathanassiou-Amore-Musique-Originale-De-Vangelis-Papathanassiou/release/7815129. Just posting to bookmark the fact I'm usually the last to know. Buy it and maybe they will sell enough to put it out on CD. The best thing about Amore is the Hammond organ, run through the Binson Echorec -- but then again, this type of sound was used to better effect on Earth and L'apocalypse des animaux. Thanks dronescape, L'apocalypse is one of my favorite albums. I bought Nocturne and I like it. If you don't expect a synth album it's easier to like. Too sweet, but still, it has it's moments. With the enormous amount of music available today "it has its moments" isn't enough anymore. At least not for full price.